Hey there, Head Ned. Where did the idea for Okilly Dokilly come from? Did you try out other characters first or is Ned the stand-out character for you? **Were you expecting the internet to explode about Okilly Dokilly? Is it awkward that only four of you have a moustache? **What are the main ingredients for nedal? **Is there a big Simpsons metal scene that’s going unnoticed? **What is the definitive best episode of The Simpsons? 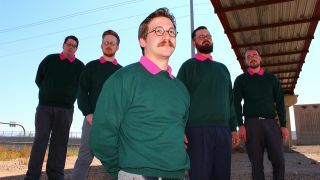 Okilly Dokilly now have a few shows lined up. Follow them on Facebook for more info.